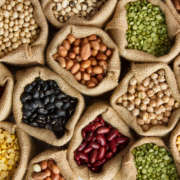 Your food can be classified into 3 primary macronutrients – protein, fat, and carbohydrates. Each of these are digested at different speeds and affect your physiology in different ways. Carbohydrates, especially simple carbs (think starches, breads, pastries and pastas), become sugar in your bloodstream anywhere from 5 to 30 minutes after eating. Fruit juices are the fastest to influence blood sugar. Yet, the higher the fiber content (think fresh non-starchy vegetables or whole fruit), the slower the carbs turn to sugar. Protein begins breaking down into sugar in your bloodstream about 2 hours after eating. That’s a significantly slower transition than with carbohydrates! When you combine starches and fruit with protein, you will slow the conversion into sugar. I’m sure that you are aware of the concern about the effect that repeated spikes in your blood sugar levels have on your body’s ability to properly use insulin. What is not often addressed is the effect that quick spikes have on the way your body will use or store the energy from the foods you consume. When you start a meal with carbohydrates that prompt a spike in blood sugar, your body is more likely to shift to fat storage mode. So the chips and salsa that are served as soon as you sit down at the Mexican restaurant, or those tasty rolls that come as an appetizer, are setting your body on fat-storage mode. However, starting a meal with protein prompts the production of stomach acid to aid in digestion, gears your body to burn the energy you are consuming, and will signal your brain that you are full faster than if you start a meal with carbs. Starting with protein may be easier for breakfast or snacks. If you find it difficult to get the protein first at lunch and dinner, an alternate approach would be to eat raw vegetables first. Vegetables are full of fiber which inhibit blood sugar spikes and mix with liquids in the stomach to make you feel full sooner. Whichever approach you take – whether eating protein or raw vegetables first – you can avoid having the energy from your food stored as fat. Leave the simple carbs until the end of your meal, or better yet, keep them out of your mouth altogether. I share this information because it’s my passion to help every one of you improve your health. Making adjustments in the foods you consume and the way you care for yourself can change the way your body functions. I stand ready to encourage and to help you pursue wellness for you, wellness for life … because your health is wealth for you and those whom you love.